Baseball is back! 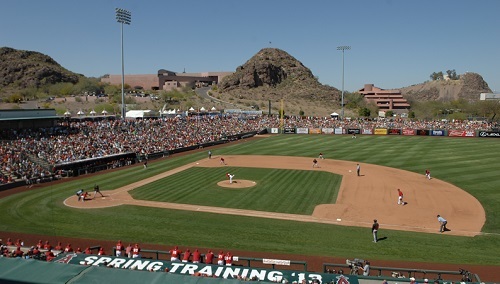 Tempe Diablo Stadium will host the Los Angeles Angels for another season of Spring Training. This season boasts matchups against the D-backs, Cubs, Dodgers and Padres to name a few. Tickets are on sale now at www.angels.com and will be available for purchase at the stadium beginning Feb. 10. Have you heard? The Angels landed MLB’s No. 1 prospect for 2018, Shohei Ohtani. Don’t miss this chance to see his historic MLB debut at beautiful Diablo stadium. Show your love of the game by welcoming the Angels to their first practice on Wednesday, Feb. 14. It’s free to attend practices and there are plenty of opportunities to grab an autograph or two from players. The Angels will take on the Milwaukee Brewers on Saturday, Feb. 24 at 1:10 p.m. See the full schedule here. Tempe Diablo Stadium is located at 2200 W. Alameda Dr. Visit www.tempe.gov/diablo for information on games, tickets, stadium hours, directions and parking.